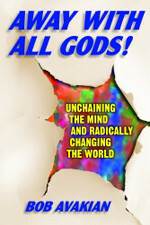 (an excerpt from Bob Avakian's book Away With All Gods! Unchaining the Mind and Radically Changing the World, Chapter 2, "Christianity, Judaism, and Islam—Rooted in the Past, Standing in the Way of the Future." In large swaths of the world, imperialism's relentless grinding up of lives and crushing of spirits has given rise to reactionary Islamic fundamentalism with the most overt oppression and degradation of women at its core. On the "other side" of the world, a culture of pornification, an ethos of male right, and laws have created a situation where one in five women will be raped or sexually assaulted while in college. Here's why: EVERY SYSTEM OF EXPLOITATION AND OPPRESSION—including capitalism-imperialism in all its variations, mutations, and byproducts—has the oppression of women woven so deeply into its fabric that to tear it out requires tearing up the whole cloth. 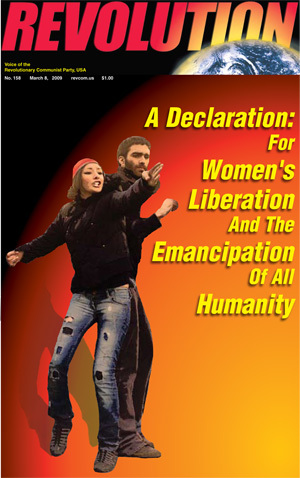 COMMUNIST REVOLUTION can, must, and will END WOMEN'S OPPRESSION because it is about ENDING ALL EXPLOITATION AND OPPRESSION. There is the leadership, strategy and program for that revolution—you'll find it at revcom.us. What is needed is YOU. "Away with All Gods! is a powerful and erudite critique of religion and superstition and a rousing call to place our trust in reason and the scientific method....Unusual for an atheist work and in marked difference to works of Sam Harris and Richard Dawkins Avakian went further to explore the way in which religion is used to sustain the status quo and as a reactionary force by political power mongers...He stands against not only religion and superstition but for reason and science and shows us what an alternative way of living can really be like. More importantly he shows us the revolutionary potential of finally doing away with all gods and what such a new world could look like."